45 Years opens in Australian cinemas on February 18 and is distributed by Madman Films. 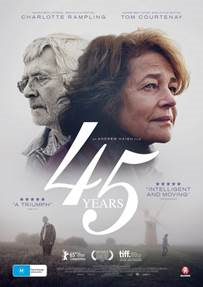 Andrew Haigh's 45 Years is a harrowing look at how those things which are long left unsaid can tear apart many years of love, trust and commitment in a matter of days and an intriguing study of the themes that emerge as a marriage progresses into it's later years. In the days approaching their 45th wedding anniversary and a grand party in their honour, Kate (Charlotte Rampling) and Geoff Mercer (Tom Courtenay) receive a letter informing them that the body of Geoff's ex-girlfriend has been found in the icy glaciers of the Swiss Alps, where she was lost decades earlier. The shock of the discovery changes Geoff's behaviour and outlook on life in a way that disrupts both planning for the upcoming party and Kate's feelings towards her husband when she realises how much he hasn't told her all these years. While the characters and storyline of 45 Years will be most relatable for those who are in the same stage of life as Kate and Geoff Mercer, it is a haunting reminder to all how fragile trust is in a marriage or any relationship. Even after four and a half decades together, the details Geoff has left out regarding a relationship he had in the time before he met Kate comes back to haunt him and does a great deal of damage that cannot be fixed with ease. Charlotte Rampling gives a wonderfully subtle performance as Kate which shows the gradual change in emotion towards her husband as a result of the things he has been hiding. With each passing day one sees her change more in how she feels towards Geoff. In 45 Years, the Mercers are first met when they are in a solid stage of marriage where they both feel comfortable and safe with one another. It is Monday when the letter is received and the film comes to it's conclusion on Saturday, which is a representation of the speed in which all the feelings and trust that has been built up over the years can change. Kate comes to feel that everything in their marriage has been a lie and that there was always a third person in their marriage which she was never aware of until now. This brings up the question of how well we really know the people we are in a relationship with and the rather depressing notion that no relationship is truly safe, no matter how new or old it may be. Haigh's screenplay brings to the surface the themes that become prevalent in a long marriage and with the inevitability of growing older. Kate and Geoff both acknowledge that neither of them are as young as they used to be and cannot do what they did as a couple when they were twenty years old. This includes a rather touching scene where the two dance before realizing neither can move the way they used to. However, Geoff is more effected by it in the circumstances. With the realisation that his lost love, Katia's body would be frozen as she was approximately fifty years ago, Geoff becomes melancholy thinking about how he has changed physically since then. He becomes obsessed with the past and irritable with those around him that wish to discuss the present or who bear no connection to when he was younger. What Geoff experiences is not unlike what many people feel as they grow older, but this is another reason for the rift between he and his wife. Tom Courtenay also puts in a fine performance as Geoff and he can really be quite frustrating at times in his preoccupation of the past and his ignorance at how well his life has tuned out. Yet, as the film is ultimately from Kate's point of view, the frustration that one feels towards Geoff is exactly how Kate or anyone in her position would feel. While 45 Years is indeed an intriguing film, it is not overly enjoyable because of it's sombre subject matter. The film can be enjoyed for it's beautiful landscape shots of the quaint English countryside, but it doesn't feel like an overall enjoyable experience and is more interesting than enjoyable. It will also not be particularly entertaining as such for some as it is rather subtle and the revelations made by the characters and their character development happens very gradually through the film. However, one cannot deny it's power to provoke thought about marriage and relationships in general. 45 Years shines a light on marriage and how fragile trust is in a relationship at any stage. 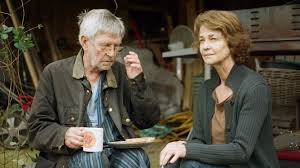 Driven by strong performances by Charlotte Rampling and Tom Courtenay, the film is dispiriting, but nevertheless thought provoking.